DUI Fatalities in Oklahoma at Five-year High - McIntyre Law P.C. From 2011 to 2012 Oklahoma saw a concerning seven percent increase in alcohol-related fatalities. At 157, 2006 had the fewest alcohol-related deaths in recent history, followed by 209 in 2009. The steep increase is concerning, and although the number of fatalities has risen between 2006 and 2012, the number of crashes has decreased from 5,442 in 2006 to 4,291 in 2012, meaning that alcohol-related crashes in Oklahoma were deadlier in 2012. McIntyre Law, P.C. has released its fifth annual McIntyre Law DUI Report with its 2012 statistics. The study is based on statistics from the National Highway Safety Administration (NHTSA), Oklahoma Highway Safety Office (OHSO) and the Fatality Analysis Reporting System (FARS). Below are a few quick facts based on Oklahoma data over the past five years. More details are available here. 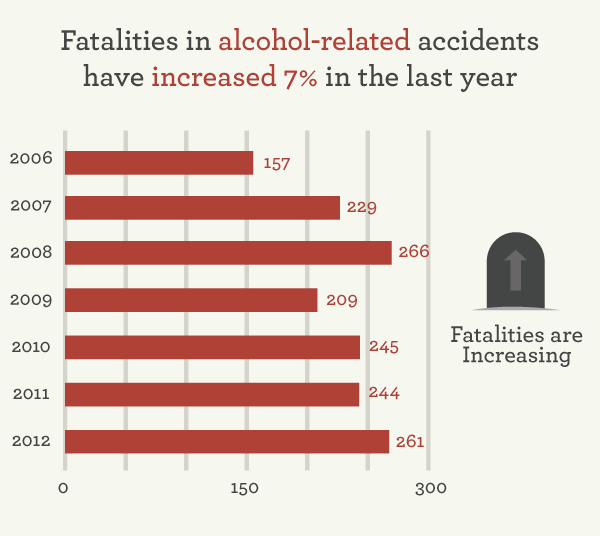 Drivers in alcohol-related fatalities have averaged 73% male and 27% female. The majority of alcohol-related fatalities take place on Saturdays and Sundays. Nearly 40% of alcohol-related fatalities happen in places where it is dark (rural roads with poor or no light). Oklahoma and Tulsa counties had the most fatalities statewide, each with over 100 since 2006. Harmon had none, and Cimmaron and Harper counties each had two. However, in reviewing the number of fatalities based on the population, Roger Mills County had 243 fatalities per 100,000 people, while Grant and Pushmataha counties each had 139 fatalities per 100,000 people. The counties with the lowest fatality rates per 100,000 people are Harmon, Garfield and Jackson. McIntyre Law, P.C. continues to publish this annual report as a way to raise awareness of DUI and its consequences. Our mission is to make Oklahoma’s roads safer and to protect the rights of car accident victims. We provide free, no-obligation consultations to people who have been injured or lost loved ones in drunk driving accidents. As well, we encourage Oklahomans to join the conversation by contacting our Oklahoma City Mothers Against Drunk Driving (MADD) chapter.